A luxurious body contouring gel with three powerful marine algae to destroy fat and refine the figure. ...a trio of naturally contouring marine algae for ultimate slimming results. 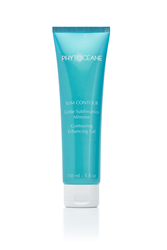 Phytocéane introduces SLIM CONTOUR Contouring Enhancing Gel, a synergetic formulation with a trio of naturally contouring marine algae for ultimate slimming results. Two brown algae species, Halopteris and Laminaria, block the creation of new fat and burn existing fat. Palmaria, a red algae, improves drainage for optimal fat elimination. Moisture-rich and ideal for massage, this transparent gel melts into the skin and leaves an ultra-soft feel. Pearlescent agents remain on the skin’s surface, instantly enhancing the skin’s appearance. SLIM CONTOUR has a feminine scent with notes of tonic, citrus, ginger, jasmine and sandalwood that linger delicately on the skin. SLIM CONTOUR Contouring Enhancing Gel,150 ml, suggested retail price $78.00. Directions for use: Apply morning and evening, using upward smoothing movements, to target areas: stomach, buttocks and thighs. Halopteris - Brown algae that limits the growth of existing fat. Less fat is created. Laminaria - Brown algae that burns existing fat and blocks the creation new fat. Less fat is stored. Palmaria - Red algae that improves drainage and the elimination of fat. *Contouring effect measured with Bodyscan. Average diminution of the figure (stomach and thighs) in volume after twice-daily application of SLIM CONTOUR by 22 women during 28 days. **Satisfaction test on 22 women after twice-daily application during 28 days. When exploring the secrets of Phytocéane you will discover a natural, marine brand that reveals precious JEWELS OF THE SEA and sets itself apart as a true treasure in the spa industry. Nestled in the heart of the Emerald Coast in France, Phytocéane embodies the region’s timeless tradition of travel, escape and discovery. This professional, naturally-based facial and body care line utilizes resources and ingredients found in the most pristine, beautiful seas around the world. We are one of the only spa brands with our own laboratory, allowing us to research and cultivate our own ingredients, develop unique cosmetic formulas, manufacture skin care products and create cutting-edge professional treatments to deliver remarkable results.